Who doesn’t know the horrifying, nerve-jangling experience of losing a mobile device? If it hasn’t yet happened to you, then count your lucky stars. First panic sets in, then shock, usually followed by the stomach-gnawing sensation of utter desperation. And that’s just your run-of-the-mill scenario. Imagine how this poor student feels. 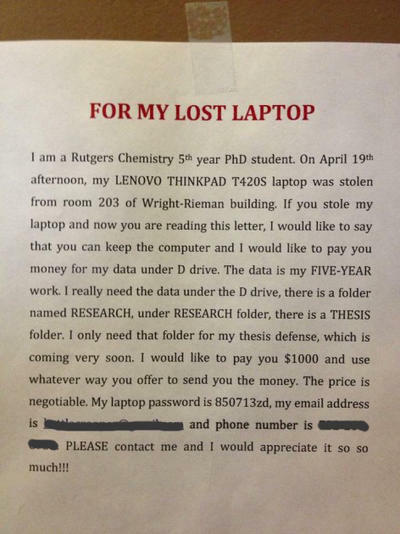 When the Rutgers Ph.D. candidate’s Lenovo Thinkpad was stolen, he lost something else that was even more important than the hardware — five years’ worth of critical research for his doctoral thesis. Talk about painful. No wonder he bit the bullet and plastered his campus with flyers offering a stunning reward: $1,000, and that’s just for the return of the data. The thief can keep the computer, no strings attached. The contact info is blacked out in the pic to deter pranksters from hitting up the poor guy and pouring salt in his wounds. But if you happen to be in the Rutgers area and know something about this, be sure to get his info from the source link and reach out to him. If you had critical data that was lost, would you pay the crook who stole it just to get it back? And when all is said and done, would you let him keep the computer? Tell us how you would’ve handled the situation in the comments. SecuritySystemReviews.com recently outlined how to avoid becoming a victim of laptop theft, so for safety tips, check out the press release below. Laptop theft is one of the most common forms of theft that occurs today, all over the world, and for many people, having a laptop stolen can cause not only inconvenience, but also loss of personal information. The security professionals at SecuritySystemReviews.com created a list of tips laptop owners can follow, to help prevent a theft from occurring. Laptops are expensive and easy targets for thieves. It’s a growing problem in the United States. It is common for many people to be attached to a laptop at nearly all times. Laptops often contain important work information, valuable identity-related information and personal items such as photos and videos. The loss of a laptop can be a very upsetting time, but unfortunately, laptop theft is incredibly common throughout the world. Many people take great precautions with home security, even installing the best home security system, but often neglect to take the same steps to protect laptops. Theft occurs in a variety of situations, from muggings, to travel and even during home break-ins, but there are steps a laptop owner can take to avoid becoming the victim of a laptop theft. The security team at SecuritySystemReviews.com, a website providing reviews of security systems, including cellular security systems companies and the best DIY security system companies, created a list of tips for laptop owners. While a theft may not be 100% avoidable, there are steps that can be taken to reduce the risk. 1. When transporting a laptop, don’t use a laptop or computer bag. This draws attention to the fact that a person has a laptop. It’s best to instead store a laptop in a backpack, briefcase or purse, if possible. 2. Consider investing in security devices and programs specifically for laptops. For people that travel with a laptop on a regular basis, it may be a good idea to use a laptop security cable to attach the computer to a heavy piece of furniture when it’s left in a hotel room. There are also a number of security programs that can be installed on a computer that will track the location of the laptop if it’s stolen. In addition, these programs also have the capability to remotely store or erase data and lock the computer. This type of software would be especially valuable for someone who has a great deal of work or personal information stored on a laptop. It’s never a good idea to leave a laptop unattended in a hotel room unless it is securely locked. 3. Never put a laptop on the floor. When traveling or out and about with a laptop, it often ends up on the floor, for various reasons, but this is an easy way for the computer to get lost or stolen. 4. If there is a lot of important or valuable information on a computer, it’s a good idea to install encryption software, which in the event of a theft will keep the thief from being able to access the data and information. 5. Never leave a laptop in a visible area of a car. This is one of the most common ways for a laptop to be stolen. Even if the computer is hidden in a bag, it’s best to put it out of sight altogether, in the trunk or under the seat. 6. Just as there are alarm systems for homes, there are also alarm systems for laptops. A laptop alarm is usually about the size of a credit card and can be attached to a USB port, so that if a laptop is moved an alarm will sound.